7 Night cruise sailing from Pagan to Mandalay onboard Orient Pandaw. 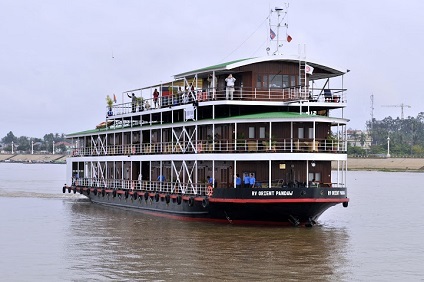 A fabulous way to discover the mighty Irrawaddy River aboard a Pandaw with up to two weekly departures between the historic royal capitals with two nights moored at Pagan and three at Mandalay as well as exploring small towns and villages of lost Burma in between. Embark the ship for lunch followed by exploration of a selection of the 3000 plus Pagan monuments by bicycle or coach. The first temple visited is Ananda, known as the finest temple in Pagan in terms of ancient architecture, built in AD 1105 by King Kyansit Thar, the third king of Pagan dynasty. Explore the high standard of Pagan craftsmanship including niches with statues, glazed plaques, the standing Buddha statues and murals. Next stop is Myingabar Gubyaukgyi temple built in AD 1113 by Prince Rajakumar, son of King Kyansit Thar. Discover the well-preserved murals which also depict typical day-to-day life in Pagan. End the day with a walk through Phwar Saw Village; a small village with just over 500 inhabitants situated between New Pagan and Nyaung U airport. It was named after the very famous and influential queen for three consecutive Kings in Pagan’s late 13th century. The villagers rely on bean and pea farming, breeding cattle and producing small lacquerware handicrafts. A short stroll in the village under the shimmering sunshine in the late afternoon is the perfect way to capture the villagers’ way of life including fetching water, herding cattle back home and preparing for dinner. Further exploration of Pagan and visit a lacquerware workshop. Visit to Shwe San Daw stupa, one of only a few monuments allowing travellers to climb it, gaining a 360-degree view over the pagoda-studded plain. The next visit is to Shwe Zi Gone Pagoda, built in AD 1086 and believed to enshrine a hair relic of the Buddha. Before returning to the ship for lunch, take a stroll around the Khay Min Ga pagoda complex to learn about the different architectural styles: Indian, Sri Lankan, Myanmar-Mon hybrid and Myanmar. Morning visit to the ancient city of Ava, which served as the capital of the Burmese kingdom for nearly 400 years, longer than any other ancient capital. Morning tour by coach to Ava jetty and across the Myit Nge(Dokehtawady) river by small ferry boat, followed by horse carts to Menu Oak Kyaung monastery built by the chief queen in 1822. End the morning with a visit to the splendid Bagaya Kyaung monastery built entirely of teak in 1834. Afternoon excursion to Sagaing where there are 1000 hermitages and sanctuaries rich in woodcarving and religious art. From Sagaing Hill admire the bird’s eye view over the Irrawaddy river curving around Sagaing from Soon U Ponnya Shin hill top-pagoda. Later an introduction to the Buddhist nuns’ way of life at a nunnery. Drive to Amarapura, a former capital (initially from 1783 to 1819 and subsequently from 1839 to 1852). Visit a silk and cotton weaving workshop, Amarapura’s major business. At sunset take a local boat on Taungthaman lake at U Bein Bridge, the world’s longest teak bridge. By 09:00am disembark in Mandalay. Each ship, hand finished in brass and teak by traditional craftsmen are in themselves objects of great beauty. The secret of our success is that on our ships, whilst luxury and comfort are discreetly present, it is the colonial character and friendly atmosphere that predominate. All our Pandaws have ultra shallow drafts and can travel to remote areas, which would be unreachable by other vessels, let alone overland. A Pandaw river expedition is not like an ocean going cruise. There is no dressing up for dinner and no ‘captain’s table’. The atmosphere on board is very friendly and informal, more like a party on a private yacht than a cruise ship. Nearly everything is included in the price and there are no hidden extras for excursions.. Even your drinks are included in the price of your ticket. There is an incredibly high level of personal service and care aboard, with a crew passenger ratio of 1:2. For these reasons passengers keep coming back and exploring more of a lost South-East Asia. Sailing on a Pandaw is essentially an outdoor experience. Whilst the staterooms are very comfortable and roomy, passengers prefer to spend their time sitting outside, on the promenade decks or on the vast observation deck above. Unlike other cruise ships every window (except port holes on the lower deck) can open. When sailing passengers sit on deck and become absorbed by great panoramas as they unfold about them. Spellbound, one cannot help but to meditate upon the unceasing human and wildlife activity of these teaming water worlds. The Pandaw stateroom is the most celebrated feature of our ships. Finished in brass and teak, the main and upper deck rooms are very spacious at 168 square feet (15.6 sqm). Much loved by all our passengers we have ensured that with each ship we build the stateroom remains the same. Our cabins do not have mini-bars, satellite TV’s, internet or phones.Pandaw passengers usually want to escape from the tiresome features found in international business hotels. 7 Night Cruise sailing from Pagan to Mandalay aboard Orient Pandaw.